Size: 5.4" x 2.7" x 0.4"
With the TI-30 SLR Texas Instruments entered 1982 the market of scientific LCD-calculators powered by solar cells. This calculator was developed and produced in Japan. The electronics of the original TI-30 SLR is based on a Toshiba calculator chip with only 9 digits of calculating precision instead of the 11 digits of typical US designs. The revised TI-30 SLR sports with the Toshiba T6974S calculator chip the same 11 digits of accuracy and traces back to algorithm developed for the Canon F-73 already in 1982. If you are interested in the calculating accuracy of scientific calculators don't miss the Calculator forensics. The real capabilities of the Toshiba T6974S calculator chip were released in the TI-35 SOLAR and the rare TI-30 SLR PLUS. Compare this Japanese design with the slanted TI-55-II, a typical US design of the same year. A big advantage of the Toshiba design was the smooth and flawless keyboard. The calculator was manufactured by Sansyu Precision Co., Ltd. (Hieda, Japan) before production was shifted to Taiwan. Don't miss the TI-30 SLR manufactured by Inventec Corporation in Taiwan. The TI-30 SLR was a very successful calculator and after a redesign it gave later the basis of products like the BA-SOLAR, the TI-30 SOLAR, the TI-31 or even the Galaxy series. You'll find the original TI-30 SLR here. 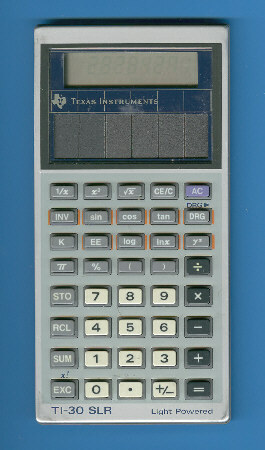 The TI-30 SLR is featured in the Texas Instruments Incorporated bulletin CL-827A dated 1985. © Joerg Woerner, October 8, 2008. No reprints without written permission.